For those of you looking for information on the go, Gluten Free Philly now comes in a handy mobile-friendly version. Just bookmark the link and you'll find it easier to view posts, menus and everything else the site has to offer on the road, whether you're at the supermarket or out for dinner. The ShopRite gift card giveaway I posted this week runs through Sunday. Just leave a comment to that post or at the Gluten Free Philly Facebook page. Maybe soon enough they'll add pizza, but for now California Pizza Kitchen (locally in King of Prussia, Main Line Philadelphia, Plymouth Meeting, Cherry Hill and Newark) has a gluten-free menu that includes soups and salads, two seafood entrees, and ice cream for dessert. In Center City, Stephen Starr's Latin restaurant Alma De Cuba (1623 Walnut Street, 215-988-1799) also has a gluten-free menu. The Philadelphia Gluten-Free Pasta Company has opened its retail shop in Media (415 East Baltimore Pike, 610-529-0122). Hours are Fridays and Saturdays from 10 a.m. to 5 p.m. Customers who stop in and purchase ravioli or gnocchi will receive free samples of the company's new dried orzo and mini shells, which are launching later this year. Martindale's in Springfield is carrying the current products. Pennsauken's Water to Go is now carrying all four varieties of the gluten-free dumplings made by Feel Good Foods. 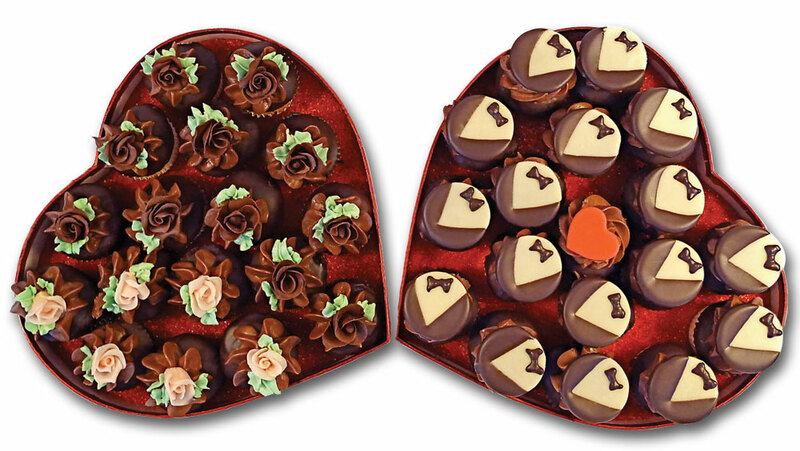 If you're looking for a Valentine's Day sweet treat, The Grain Exchange is offering a heart-shaped box filled with gluten-free mini cupcakes (in chocolate, vanilla or red velvet) decorated with handmade chocolate roses for ladies and tuxedos for men. The red cupcake box will be placed in a gift box with a clear lid, wrapped with ribbon. 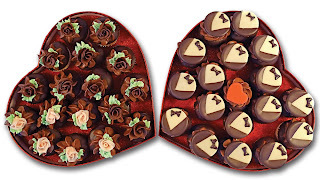 Each gift contains 18 mini cupcakes, which have a filled center and are also peanut and nut free, and costs $36.99. Customers can call 215-531-1261 to place orders, which will need to be picked up in Doylestown. Meanwhile, Sweet Freedom Bakery has heart-shaped cookie cakes and pink frosted sugar cookies, along with Valentine's-themed cupcakes. The bakery will be open on Valentine's Day Monday. Call 215-545-1899 to place orders. As always, any purchases at Amazon.com made after clicking the Amazon links at Gluten Free Philly support the site. My thanks to those of you who have expressed your appreciation in this fashion. New at Whole Foods are frozen meals-in-a-bowl from Colorado-based Evol Foods. 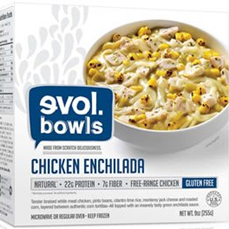 They come in four varieties: Bean & Cheese Enchilada (vegetarian), Chicken Enchilada, Fire-Grilled Steak and Chicken Teriyaki, all of which are gluten free. The meals are made with all-natural ingredients and are high in protein and fiber. Chips are dippable, but popcorn - not so much. 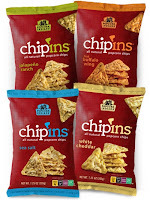 That all changes with Popcorn, Indiana's new chip'ins all-natural popcorn chips. The snacks come in four varieties: Sea Salt, White Cheddar, Jalapeno Ranch and Hot Buffalo Wing. 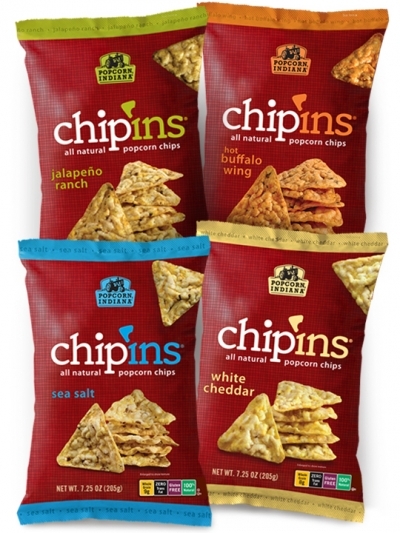 The chips are available nationwide at Walmart, Walgreens, BJs, select Whole Foods and Costco retailers. 10 Arts Bistro & Lounge pastry chef Monica Glass will be leading a cooking class on gluten-free desserts at Sur La Table in King of Prussia on Thursday, February 17. On the menu are Chocolate Hazelnut Tarts, Brownies, Yogurt Ginger Panna Cotta Verrines, Chickpea Shortbread, Marsala Poached Pears with Almond Streusel and Whipped Crème Fraiche. Tickets are now on sale for Celiac Awareness Night at the Phillies game against the Atlanta Braves on Friday, July 8. A portion of the proceeds from purchases using the code CELIAC will benefit celiac awareness efforts. With thanks to reader Mark M., I'll leave you this week with the recently debuted commercial touting the gluten-free status of most Chex cereals (posted on YouTube by Gluten Freeville). Have a great weekend! I love California Pizza Kitchen! This is good news. Greetings! I am going down to see the Phillies during Spring Training and was wondering if anyone knew if Bright House Field offered any gluten free products. I noticed a useful post on this site from last year with links to restaurants in the Clearwater/Tampa Bay area but was wondering if anyone was able to eat in the ballpark. Any info would be appreciated.